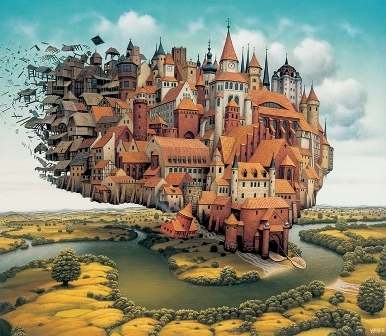 I first encountered Jacek Yerka’s work via a blog I frequent and as soon as I did, I knew I’d found something special. I’ve never studied art so I can’t use fancy terms to explain what it means or why I like it, but I do find certain art works and artists inspiring. Needless to say I like pieces that tell a story and count Henri Rosseau and Frida Kahlo as two of my other favourite artists. Jacek Yerka was born in Poland in 1952. He came from an artistic family and as a child used art to escape from social problems he had with others. He studied fine art and graphic design, developing a detailed style, somewhat against the broader fashion of the day and in 1980 he became a full time artist. There is no doubt that his paintings tell stories and they remind me of other creative works like the films of Hayao Misaki or the books of Tolkien. 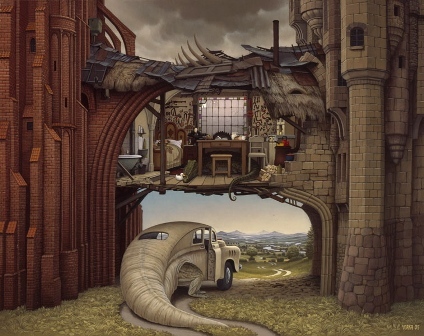 But Yerka’s imagery is very much his own and, although some work comes from dreams and imagination, he states his greatest influence is the Polish landscape and the places he grew up. One day I hope to save up enough to buy one of his pieces – of course then the problem will be picking one. There’s much, much more than what I’ve popped in here so if you’ve not seen his work before, get over to Yerkaland and be prepared to be inspired!